The Chopper motorcycle is a movement in its own right- it’s about art and engineering, American traits, freedom and individuality, attitude and a lot more. The Chopper craze has moved through several ebbs and tides, but continues to ride strong through the decades. So, what exactly is the Chopper? Well before we discuss this, we would have to understand a bit about the Bobber history. The former is a direct descendant of the latter. Even before the Chopper made a thudding entry on the motorcycle scene, styles like the cut-down and the bob-job were what you’d largely see on the roads and these were called Bobbers. It was the GI’s returning from WWII that were responsible for getting the Chopper movement on its wheels. What we are talking about here is about how the Bobber was born, but then this was the foundation that the Chopper was built on, and so it can’t really go without a mention. By the 1960s, this trend and craze took on a whole new dimension even as the next-gen bikers emerged. The already bobbed bikes went through another axing so to say- the frames were either chopped or stretched- this changed the angle of their steering. The enthusiastic riders went whole hog with this transformation and the fork tunes were also extended; this helped improve ground clearance. Raising the handlebars improved leverage and a new fearless breed of Bobbers was born- the curtains were raised to the “Chopper”.This motorcycle has some distinctive features like the tall sissybar, extended forks and no rear suspension. It was a style that emerged from efforts to make bikes like the Harley-Davidsons much lighter, agile and faster. However, the Choppers are less about mechanics and more about motorcycle culture, changing race relations as well as some distinct societal shifts that were a result of WWII. Of course this motorcycle has a distinct smattering of the explosive counterculture that was the mark of the 1950s and the 1960s. The Chopper also found stardom and even more fame in biker movies like the world-renowned ‘Easy Rider’- in fact this movie singularly makes Chopper history even more glamorous and alive. The bikes used in this 1969 film weren’t just rolled out of a showroom right into the spotlight. These Choppers were handcrafted and very true to the folk art form they symbolize. The most legendary of these, is the “Captain America” bike. Its impact on the motorcycling space has been enormous. ‘Easy Rider’ made famous the iconic red, white & blue chopper and this motorcycle style was permanently etched into American motorcycle land. This one movie popularized Choppers across the world, more than any other motorcycle. All of a sudden, people in Japan, China, Russia and Czechoslovakia were building Choppers. Even at this time, the Choppers were largely associated with their builders and they were essentially an artistic creation. Documentaries such as Born To Be Wild (1995) & Easy Rider: Shaking The Cage (1999) made these bikes even more famous, but neither of these actually talked about a specific builder that was responsible for engineering the bikes from Easy Rider. Later, it was found that 2 African-American bike builders named Clifford “Soney” Vaughs (the bike designer) and Ben Hardy (a reputed chopper-builder in LA), had worked on the construction of the Easy Rider bikes. Around the same time, the image of the Chopper got slightly tarnished as these bikes were also widely used by motorcycle gangs. But interestingly, the ‘bad boy’ image that motorcycling developed due to this, didn’t take long to fade and the Chopper just provedto be the undying monarch of the asphalt. 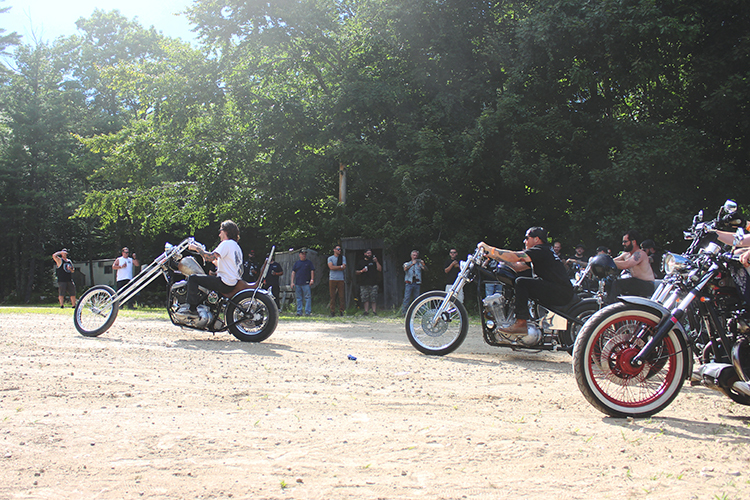 Over the years, many small motorcycle customizers and firms sprung up and they began capitalizing on this Chopper craze. Before long, Chopper aficionados were able to purchase a Chopper frame, tank and fork, out of catalogues and they could assemble their very own unique chopper at home.These bikes looked cool, but were uncomfortable and difficult to ride. The rigid frame with its long fork didn’t really handle well at lower speeds. From the 1990s to the early 2000s, an entire new gen of Chopper builders made their appearance on the scene and Jesse James’ West Coast Choppers operation was right there in the spotlight. The custom-made Choppers he built could easily retail for almost six figures and they had very distinctive levels of artistic merit and impeccable craftsmanship. Before long, literally hundreds of small Chopper manufacturers mushroomed across the country and they were all trying to build their own version of the classic bike- some quite stunning, while the others, not so much. And then came the economic depression of 2008; it hit the motorcycle industry in a very big way and the smaller manufacturers were all but destroyed. Even as the dust began to settle, the most reputed and well known Chopper Builders such as Jesse James’ West Coast Choppers and Big Dog were in the doldrums. Today, the Chopper industry is on the mend and many motorcycle enthusiasts are still attracted in a big way to the Chopper aesthetic. No matter which new bike bends the rules and tries to make a statement, the Chopper will always have its own distinct place in Chopper history. Its die-hard fans will always remain fans, even as new ‘ones are born. There is also a Chopper Institute that’s dedicated to fostering newbie designers & builders. It’s said that ‘History Repeats Itself’- and by the looks of it, another Chopper Revival is just round the bend- the ‘Less is More’ motorcycle mantra lives on!